The Cape Epic mountain bike stage race turned into a way of life for us average guys on mountain bikes. It started as a crazy idea in 2005 to try to finish the Magical and Untamed mountain bike race. That turned into 5 Cape Epics, 4 in a row, plus another one 5 years later in 2012. We never thought we would be able to finish one, let alone 5. Needless to say we learned a lot along the way. In our Cape Epic Training Guide we have documented what we did and learned, all the Cape Epic tips and advice. Here we share our experience and advice because one thing is for sure, the more you know the more you will enjoy it. We are not elites with super genes or professors in sports science. Our advice is based on real world experience that we have kept track of over 9 years and 5 Epic events. If you want real mountain biking advice then see The Sunscreen Song for Mountain Bikers. The Cape Epic is the holy grail of mountain biking and remains the ultimate challenge and the benchmark. 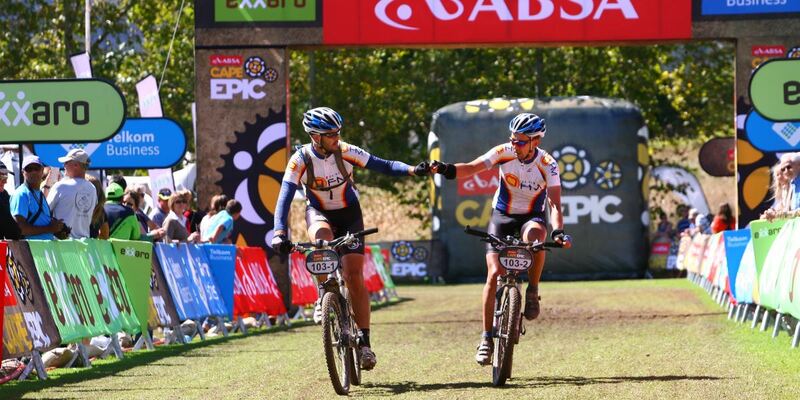 The level of competition at the Cape Epic has been increasing every year. This is evident from the level of competition at the front of the field as well as the increasing speed of the mid pack and the increased level of preparation of the back markers. As more and more people discover the magic of completing such a tough event they realise just how the impossible suddenly becomes achievable. An interesting dynamic of mutual respect emerges where you can rub shoulders with the worlds best riders. Back markers wonder in awe how the pros manage to race at average speeds exceeding 30km/h and finish by mid morning. Meanwhile the pros show great admiration for the courage and endurance the backmarkers show spending over 8 hours in the saddle, day after day. The start seems surreal as you can no longer contain the energy, nerves and anticipation of getting on the road. You start the race not knowing how you are going to finish or how you are going to get there. All you have is the faith in your partner, your training, ability and your bike. For 8 days and over 900km you will ride from water point to water point, day to day until you cross the line. The first days seem impossible the middle days blur and the final days pass too quickly. The post epic depression is common for all. The struggle to return to a life of normality far removed from the mindless peaceful pedaling of your bike with nothing but mountains all around you. For some once is enough, others would love to be back and then there are a few who return year after year. Wiser stronger and better prepared, it never gets easier just more challenging. Getting Sponsorship – In the age of blogging and reality TV there is no excuse for average Joe not to get sponsored. The Real Cost – What does it really cost to do the Epic and can you afford not to do it? Discovering the Mountain Biking Lifestyle – How you go from weekend warrior to Cape Epic finisher. The Epic Decision – How to Enter the Cape Epic – Deciding to do it is one thing, then actually getting an entry is another – if you really want to ride, you will. How to Choose an Epic Partner for a Stage Race – Its a team event so you must choose carefully, there are a few tips and tricks to getting it right or wrong. Epic Mountain Bike Training Plan – A complete plan including distance, multi-day rides and lots of climbing will get you through. Heart Rate Training Program – This is the core to your training plan and is like having your own personal coach. Heart Rate Training Basics – Understand the basics of heart rate based training and design your own training plans. Health and Nutrition – Demanding training requires lots of energy and a healthy body, expert advice and learning more is the secret.